There are few sounds more ubiquitous in electronic music than the punchy grooves of Roland's classic TR grooveboxes. From the booming, kick-driven sound of modern Hip-Hop and R&B, to the crunchy retro grooves of House and Techno - there are few strains of club-friendly music that don't have their roots planted in those classic beatmakers. They're sounds that are readily available to modern producers too. Even if you don't want to shell out thousands on eBay for the actual machines, you can get these classic sounds (or near flawless approximations of them) from countless hardware imitators, or bundled as sample packs with pretty much every DAW, sampler or drum machine (or as a download from FM's vault!). That's why we're focusing on those sounds in this issue's cover feature. Wherever you choose to get your source sounds from, we'll show you how to process, layer, tune and manipulate them into the perfect beat. Be sure to grab your videos, samples and tutorial files to download from http://vault.futuremusic.co.uk. 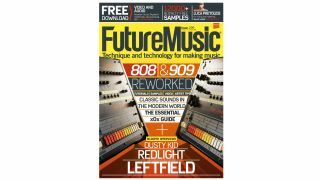 Subscribe to Future Music and save up to 56%! Sounds Of The City - Urban recordings, chopped and processed to create a pack of uniquely textured one-shots and loops. Full Spectrum Bass -Bass sounds to fill the full frequency spectrum. From mid-range bass to thick subs and classic squarewaves. PLUS: Access the FM sample archive - Download the latest 'Archive' packs and get over 8GB of loops, hits and instruments from our back catalogue of high-quality and royalty-free samples. From vintage synths and drum machines to esoteric instruments and FX - think of it as our best of. All the samples you need to create great music!